Last season, America’s Got Talent rose significantly in the ratings. Back in February though, Nick Cannon — who hosted the past eight cycles– publicly parted ways with the series. With Tyra Banks now taking the reins, will the audience dwindle, or increase? Will America’s Got Talent be cancelled or renewed for season 13? Stay tuned. A nationwide talent competition, America’s Got Talent features various individual and group performances. The winning act wins a cash prize and the chance to headline in the America’s Got Talent Live show in Las Vegas. Returning as judges are Howie Mandel, Simon Cowell, Melanie Brown, and Heidi Klum. Guest judges in season 12 include Chris Hardwick, DJ Khaled, Laverne Cox, and Seal. The NBC series typically airs on Tuesdays (and also on Wednesdays, during the live performances and results episodes). **Update below. 9/20 update: You can see the rest of the latest night’s ratings. For comparisons: The Tuesday edition of season 11 averaged a 2.48 rating in the 18-49 demographic and 11.707 million total viewers, an increase over season 10, by 5.47% and 9.41%, respectively. What do you think? Do you like the America’s Got Talent TV series? Would you like to see it cancelled or renewed for a 13th season? 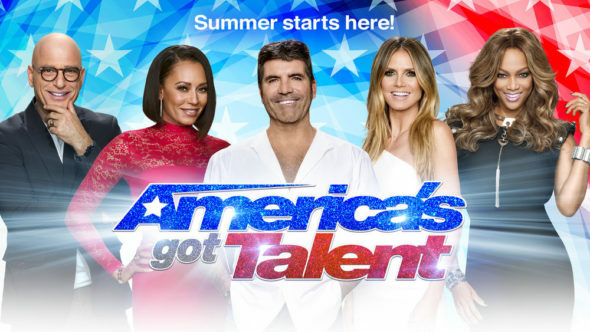 **2/21 update: NBC has renewed America’s Got Talent for season 13. Details here. I think, to keep ratings up, you need to get 4 new judges. It would be absolutely terrific if you can get Nick back to host. He was super great, and added a lot to the show. I get so turned off by Mel B’s phony drama, and Simon’s T-shirt wardrobe. I feel exactly how you feel and have been watching since the beginning but I moved on to. Nick made that show and since he isn’t hosting any more, I stopped watching plus I couldn’t stand the way Mel B’s attire was too. It gives a bad image for our young people. I love her selections and they are no more revealing than the things young people are wearing on the streets, to school and wherever.